More wine | Where have the days gone? It was almost noon by the time we finished our Peller surveys and champagne, so we chose to go to Hillebrand next, where D&E knew they had a nice restaurant. Very nice, in fact. 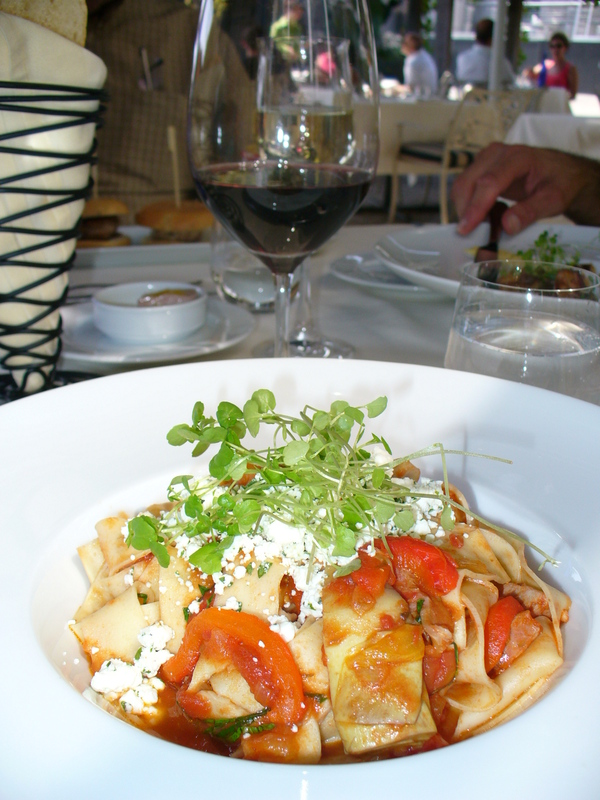 We were able to sit outside, and after the sun-dried tomato bread with wine butter, I had the handmade pappardelle pasta with a fresh tomato sauce with roasted sweet peppers, smoked chicken, spiced sausage, and topped with feta and micro-cress. Really excellent, especially with their 2004 Merlot it was paired with. There was a really lovely looking dessert menu, but it was already 1:30 or so, and we knew we had another big meal coming at 5:00, so I had to pass up the Brown Sugar and Peach Jam potted ice cream. Next time.